Regular readers of Business Travel News will know that editor-in-chief Malcolm Ginsberg has been looking after the weekly bulletin while editor Richard Cawthorne has taken what he terms a “short sabbatical”. Last week, the two finally caught up at The Loft, a congenial bar situated on the first floor of the new Intercontinental Hotel in Perth, Western Australia), sited right in the centre of what is quickly becoming the Dominion's third largest city. It proved to be an ideal spot to prepare a handover of the publication. Ginsberg has since transferred to Sydney via a night flight on JetStar, the Qantas ‘low-cost’ offspring, a passage that turned out to be less demanding than predicted, certainly more easyJet than Ryanair and in some ways better than the competing QF service. Who needs sustenance on a ‘red eye? And, it is quicker to get on and off a 180-seat Airbus than a 291-seat version, albeit with a slightly better seat pitch (31in v 29in). Pay to sit up front. A much more congenial ride. This is a combined starter to the capital of Western Australia. More will follow in subsequent weeks. Perth has long been hailed as one of the world’s most attractive capital cities, but it is far from resting on its laurels. A walk along the esplanade fronting the Swan River between the modern Perth Convention Centre and the Supreme Court Gardens reveals the latest evidence. This article is more an introduction to a city that was not founded by convicts in the normal sense. The governor of the 1850s wanted labour, and forced migrants were the answer. Perth has never looked back. Typical is the central waterside area around Elizabeth Quay, once a swamp. It is the scene of a major construction project encompassing a central landmark building that will eventually house a new Ritz-Carlton hotel and associated apartments, with the rest of the site occupied by cafés, restaurants and new attractions joining the long-established bus, train and river ferry terminals. The whole complex is framed by a forest of recently-built skyscrapers, home to offices of some of the world’s biggest mining and exploration corporations, the people behind the boom that propelled modern Western Australia into the big time. 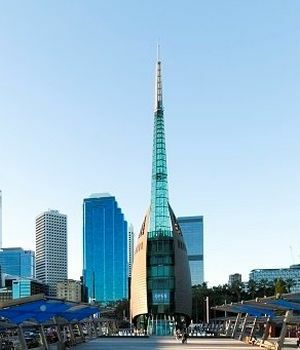 The dominant feature of the riverside complex is the Perth Bell Tower, housing 18 bells in a 270ft (82.5m) needle-shaped glass and copper structure that has become one of the city’s most recognisable icons. Twelve of the bells, including one dating from the mid-16th century and reputed to be the oldest in Australia, were donated to the state by St Martin-in-the-Fields in London, six more were cast by the Whitechapel Foundry from metal mined in Western Australia. Visitors can climb the tower and try chiming a bell for themselves. The river itself, plus a string of white-sand beach communities lining the Indian Ocean, are what give Perth its reputation as an attractive place to be. The Swan is a vast waterway stretching inland from Perth and its presence is felt everywhere. A good vantage place from which to admire it is the large and impressive State War Memorial, a focal point of Kings Park, Perth’s most popular destination and at 990 acres said to be the biggest green space of its kind in the world. The beaches, especially at this time of year in the middle of the Australian summer, are straight out of the brochures. Main centres for those most accessible for visitors to Perth range from Mandurah in the south through Rockingham and Fremantle to Scarborough in the north. Top names include Madorah Bay, Safety Bay and Shoalwater Islands Marine Park between Mandurah and Rockingham, Kwinana and Coogee south of Fremantle, Cottesloe to the north and Swanbourne, Floreat and Trigg Beach near Scarborough. Against this backdrop, Perth is showing all the signs of big-city confidence, with big-brand hotels like the InterContinental joining the line-up, plenty of refurbishment of existing buildings and new construction and a healthy culture, entertainment and food-and-drink sector. If that’s not enough, the city’s sphere of influence extends to its near-neighbour Fremantle, an equally-historic community that has developed into a sort of rowdy sibling with lively bars and restaurants, and a weekend cavalcade of restored old cars and new Harley-Davidson motorcycles. The whole of Perth's central area is free on public transport and in particular two hop-on hop-off bus routes which cover most of the city. Londoners will find one station name confusing. Perth Underground. It means just that particular station is underground, with the next stop Elizabeth Quay. There is also a very good rail network to the outlying places including Fremantle, still a major port but transformed from the run-down docks of yesteryear to trendy clubs, eating places and boutiques. Fremantle also has a large jail not far from the centre as a major tourist attraction. More anon. The Perth Festival is Australia's longest-running cultural festival, established back in 1953 and said to be the third largest of its type in the world. The programme features contemporary and classical music, dance, theatre, opera, visual arts, and large-scale public works. It runs every year from February to March and literally takes over the city. Perth will become the first Australian city to have non-stop air services from Europe next month with Qantas flying direct. Add the 17hr, 12,000mi flight to your bucket list.